A - Used to link a domain or subdomain to an IPv4 address. AAAA - Used to link a domain or subdomain to an IPv6 address. CNAME - Used to link a domain or subdomain to another domain or subdomain. For most purposes, you’ll only need to use A and AAAA records. Each DreamCompute instance in the US-East 2 cluster is assigned a public IPv4 and IPv6 address. If you have multiple instances, you will have multiple public IPv4 and IPv6 addresses. You will need to track which addresses host which websites or other services. If your domain is on this page and already hosted, set it to 'DNS Only'. If your domain is not listed on this page, click the 'Add Hosting to a Domain / Sub-Domain' button near the top left of the page. Scroll down to the 'DNS Only' hosting section towards the bottom, and enter your domain. Then click the 'Host DNS only!' button. Back on the 'Manage Domains' page, click the 'DNS' link directly under your domain name. Name — The name of the subdomain you want to use with this cloud IP address. Type — Select "A" since you're going to add an IPv4 A record. Value — This is the public IPv4 address for your DreamCompute instance. Once you've entered all of that information, click "Add Record Now!". Repeat the last step as many times as needed to add additional A records for domains you wish to host on your instance. 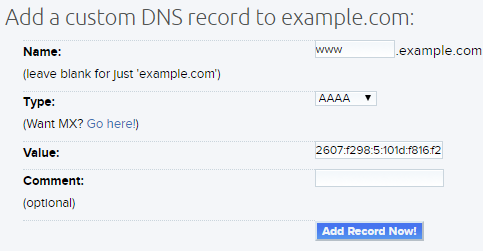 Using the steps above, you can also create an A record for the non-www version of your site URL. All you need to do is leave the name field blank. After the DNS entries are saved, the DNS must propagate which can take several hours. The default TTL (time-to-live) for DreamHost name servers is 4 hours, so any change to your DNS records should be updated nearly everywhere around the world in that time. If you will be making frequent changes to your DNS, you can contact DreamHost support to have your TTL changed to 5 minutes instead. How do I change my nameservers at DreamHost?